Founded in 1851 by Cornishman Walter Hicks, St Austell Brewery remains to this day an independent and family-owned business. Today the business operates pubs and inns across the South West - including favourite local haunts close to us here in Cornwall such as the Pandora Inn on Restronguet Creek - as well as producing award-winning draughts and bottles available across the UK. The refurbished and award-winning visitor centre, restaurant and shop was undertaken by interior and architectural practice 3idog. 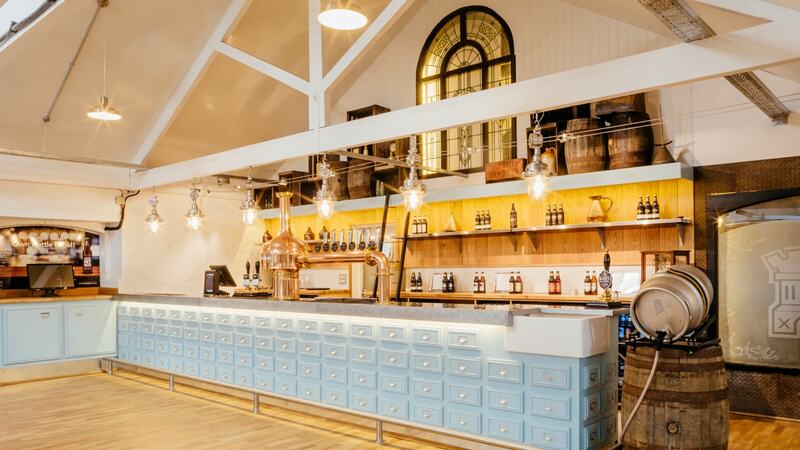 Featuring skinflint industrial pendant lighting and apothecary-style drawers in the Hick’s Bar, the bright and airy space has been designed to accommodate a large number of visitors on - what some would say the favourite - part of their brewing experience tour. Six of our Soviet-era industrial pendant lights salvaged from factories in the former CCCP are suspended above the counter providing illumination for the bar and tasting area below. Featuring detailed manufacturer’s marks and castings, the polished aluminium enclosures complement the aluminium bar top and shelving.